Welcome to CoCoBoot. This web page is the informational web page for Brett Gordon's CoCoBoot project. 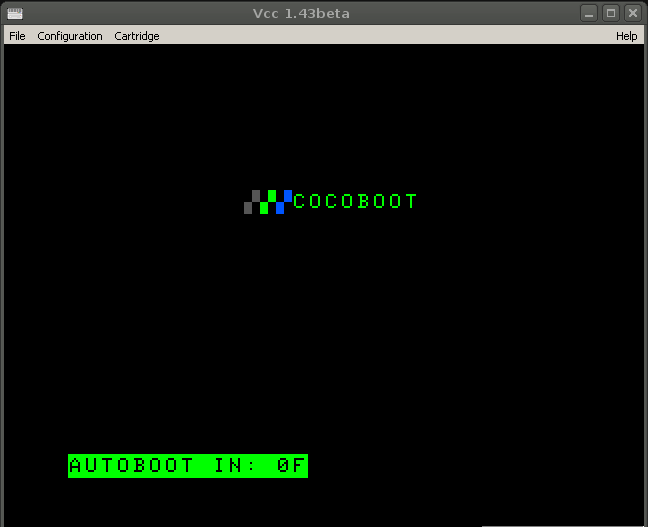 CoCoBoot is a stand-alone program written for the cira 1980's Tandy Color Computer 1,2 and 3. CoCoBoot is designed to be a flexible booting/BASIC replacement. It'll do more than boot your computer... CoCoBoot will be full Forth Programing Environment, and comes with all the flavors of HDB and RBF disk drivers. Legs is a new incarnation of CoCoBoot's forth engine. In fact, it is a stand-alone Vitual Machine (VM) designed for general programming. Anything that can have a Legs VM can run the same code. Read Legs VM. \ Load the HDB drivers associated with profile no 1. I'm jumped into the CoCoSDC feeding frenzy. My SDC showed up in the mail last week (Thanks Darren, Ed, Tim ). CoCoBoot supported the FLASH ram banks in the SDC, and now supports the CoCoSDC's LBA mode. I have tested against the stock Nitros9 SDC image, and it works just fine. As usual, I have updated the "Download" section with a new pre-built DSK image for your enjoyment. Because CoCoBoot re-uses the stock HDBDOS drivers, I have added a new flavor of HDB, that support SDC, to the mix. 1. CoCoBoot, in order to hack HDB sits in lower RAM memory, and uses a fair amount of memory to boot. The answer was some hairy hacking of HDBDOS's HWINIT routine, to replace the code for autobooting "AUTOEXEC.BAS" to make it auto-run a bin file. Actually, besides for the awful spaghetti code of BASIC (I had to wrangle a bit with its expression evaluator - which is particular horrible), it was easier than I anticipated to patch HDB. Darg! Umph! Grrrr.... Cursor Good! The cocoboot setup program now uses a cursor and then "enter" key to select menu items. A new disk image release has been released. Added some file load thermometers for fun last night. I was erked by CoCoBoot not showing anything that was going on especially on the long load of OS9Boot. Now at least we have some visual feedback to let you know your wait is not in vane. And I uncovered two previously hidden (and bad) bugs. We're back to not clearing the OS9 screen on boot until I fix that. I've reworked the setup system a bit and increased the number of profiles to 8. Also, Nitros9 boot profiles now let you control a pause before mounting root. A pause while booting Nitros9 is very handy for when your Nitros9 and cocoboot boot from the same drive... it gives you the ability to manually switch disk *before* attempting to boot Nitros9. Also, the profile editor now allows one to copy and/or del boot profiles. Preliminary support for booting to a user defined SDC flash ROM bank has been coded. Thanks to Darren Atkinson for help in getting this implemented! Check the "Download" link for the lasted DSK image. Enjoy! I added routines for IDE and SCSI sector deblocking allowing me to boot Nitros the "new" way on devices supporting 512 byte sectors. It worked well enough on my real coco3 using Cloud-9's SuperIDE controller. Oddly enough the Nitros on my CF is a old Version 2.9. But it still had a OS9Boot file and an old version of CCBKRN from cocoboot1 days. I'll be darned if it didn't boot up just fine! I only have composite here, so the default os9boot screen is kinda hideously unreadable, but it works. This demo will boot Nitros9 via Drivewire/bitbanger, or Drivewire/Becker port. filesystem. Now, in DriveWire, insert either "becker.dsk" or "dw.dsk"
into drive 0, and of course, "hit any key"